Could you introduce yourself and talk a little bit about your role on the project? Sure. 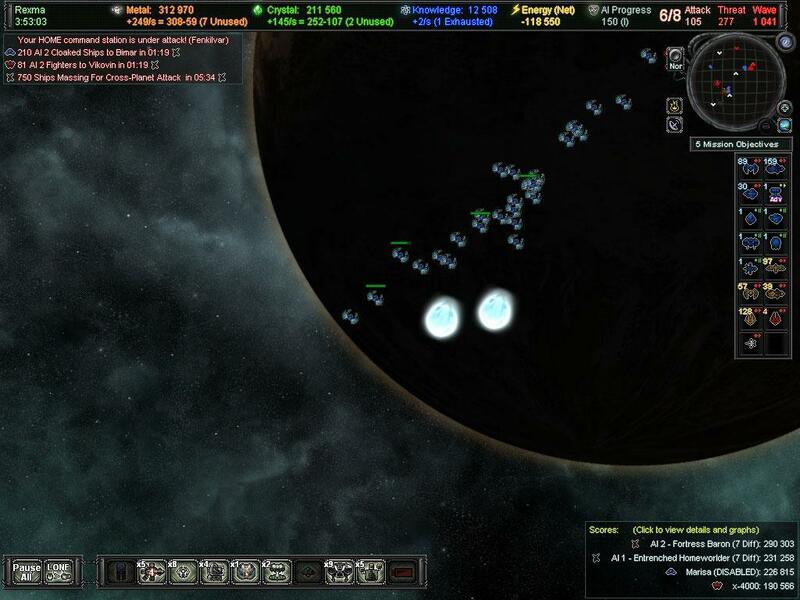 My name is Chris Park, and I’m the lead designer and sole programmer for AI War: Fleet Command. I’ve been doing hobbyist level design, game design, mods, campaigns, and so forth since I was a kid, but I’ve been a business software developer for the last eight years. Since 2003 I’ve been getting more and more into actually programming my own games, as opposed to developing hobbyist content for other people’s titles. I founded Arcen Games in hopes of eventually making a living off of my work in games, rather than business software. As of December, that dream is finally becoming a reality, so it’s a very exciting time. Why don’t you tell us a little about your team, your design philosophy, and what made you decide to jump into the 4X world. Arcen started out as just me, and actually I was working on AI War for a good half year before the company even existed. In early 2009 I contracted a great up-and-coming composer from UNC, Pablo Vega, to do the music on AI War, and in December he’s going to be joining our team fulltime as well in order to handle all of our music and sound work. For the initial release of AI War, all the way back in May of this year, that was the entire team of staff – though for AI War I had my three awesome alpha testers of my dad, my uncle, and my uncle’s colleague. 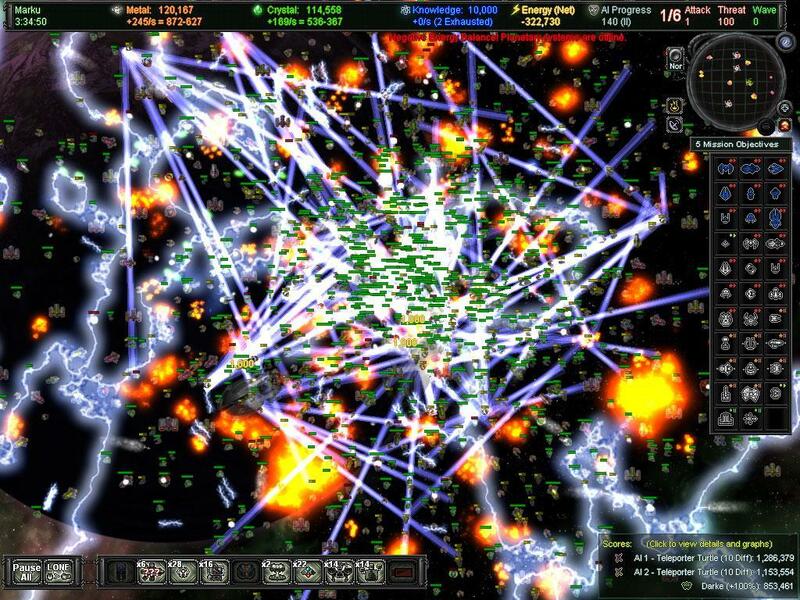 I’ve had a longstanding weekly co-op RTS session with them since 1998 or so (although Civilization IV, Neverwinter Nights, and a few other non-RTS titles did sneak into our sessions), and it was my frustration over the current strategy offerings that led me to create AI War. Other titles just didn’t emphasize co-op enough or in the right way, or didn’t have random maps or multiplayer savegames, or enough depth for long-term play, or – and this is the clincher – strong enough AI to hold our interest for more than a few months. AI War was born out of a desire for a specific sort of collaborative strategy-intensive experience that I wasn’t finding in the AAA titles. After the initial release of AI War, we started having some moderate financial success and were able to grow the team. Philippe Chabot joined the team fulltime in August as our new artist, and the game is amazingly better thanks to his work. Lars Bull had been the most prolific contributor out of all my various beta testers, and joined the team on a part-time basis both to help out with AI War, and so that we could create an upcoming casual puzzle game together. Calvin Southwood was one of our most active early fans, and he also joined the team on a part-time basis to help us with techwriting, forum moderation, and otherwise. And then, of course, there are hundreds of fans from our forums who have contributed to the ongoing design discussion about AI War and its expansions since our release, and have helped make our 2.0 version a reality. When it comes to my design philosophy, I’m all about efficiency and keeping an eye toward the big picture as development proceeds. In the business software world, I was accustomed to billing clients by the hour and needing to keep time spent to a minimum for their sake and mine, and that mindset has definitely carried over to Arcen. Gameplay and fun-factor are the key foci for our games, and we focus on polishing those through iterative design processes. Another thing I’ve learned from business programming is the value of a Subject Matter Expert, or SME, on a project. For this reason, I only make games that I actually want to play myself, so that I can act as my own SME when evaluating if it is any good or not. Even so, we seek fan feedback early and often with prerelease beta and even alpha versions of our software. Thus we wind up with a whole team of motivated SMEs contributing insights, advice, and ideas, and I think that really shows in the end products. 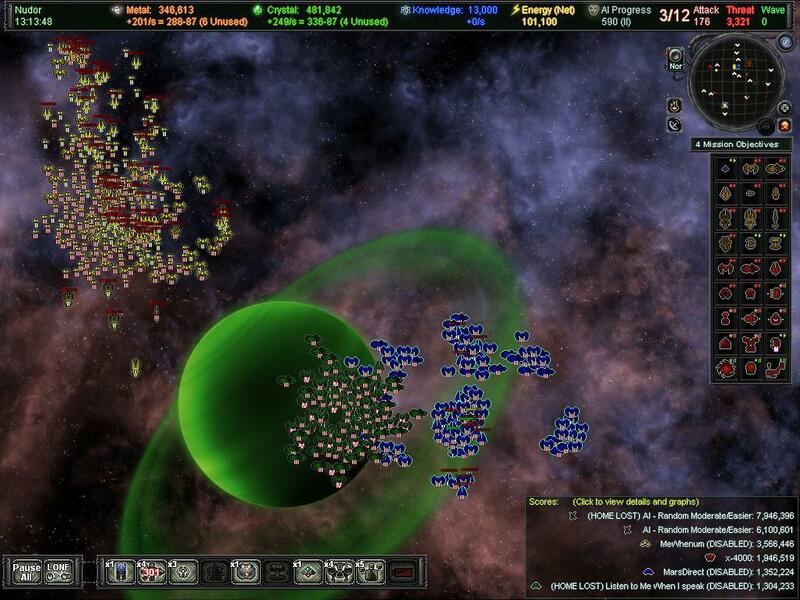 Could you talk about what separates AI War from other 4X games like Galactic Civilization II? 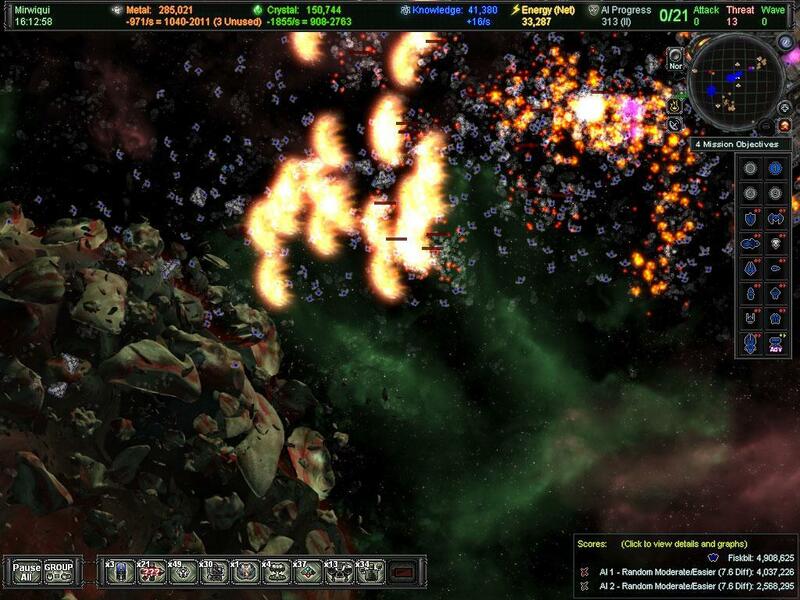 Well, AI War is realtime, unlike most other 4X games, which tend to be turn-based. But more significantly than that, I made a very RTS-style control scheme for the game. I basically wanted an RTS game that played over a 4X sort of time span, with the sort of strategic choices that you normally only see in a turn-based game. Many RTS games wind up with cop-out strategies such as just rushing, or just turtling for a while and then using a huge mass of guys to overwhelm your opponent, but you don’t see that sort of thing much at all in the TBS/4X world. 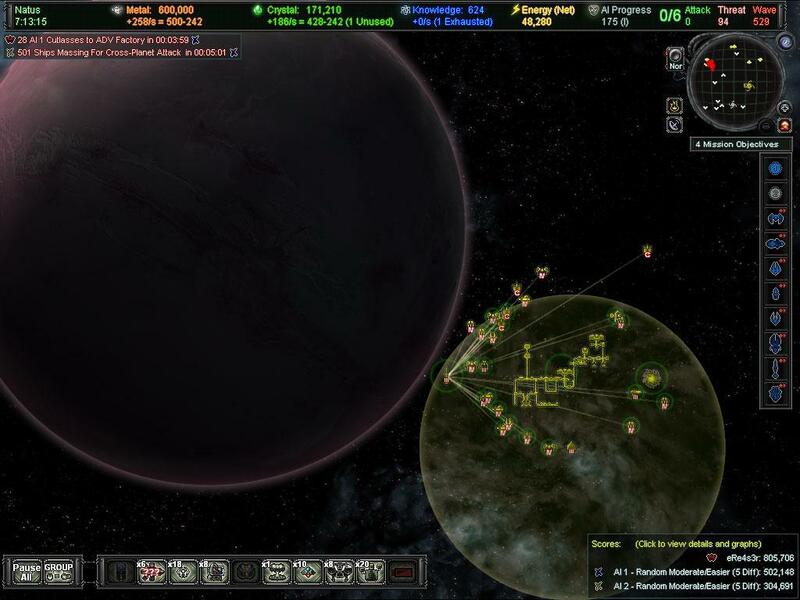 Using the galactic scale and all of the hard choices that our AI Progress metric creates for players, but in full realtime, you wind up with much more of a true RTS/4X hybrid than I think has been seen before. Most RTS games have very streamlined interfaces, and very few if any subscreens, and this is the sort of approach I took with AI War. As much as I love some of the great 4X games, I’m not in love with the volume and depth of all the subscreens that tend to show up there. One key thing in a turn-based game is that you have basically infinite time to think about any given move, and so in that context subscreens are not so much an issue. 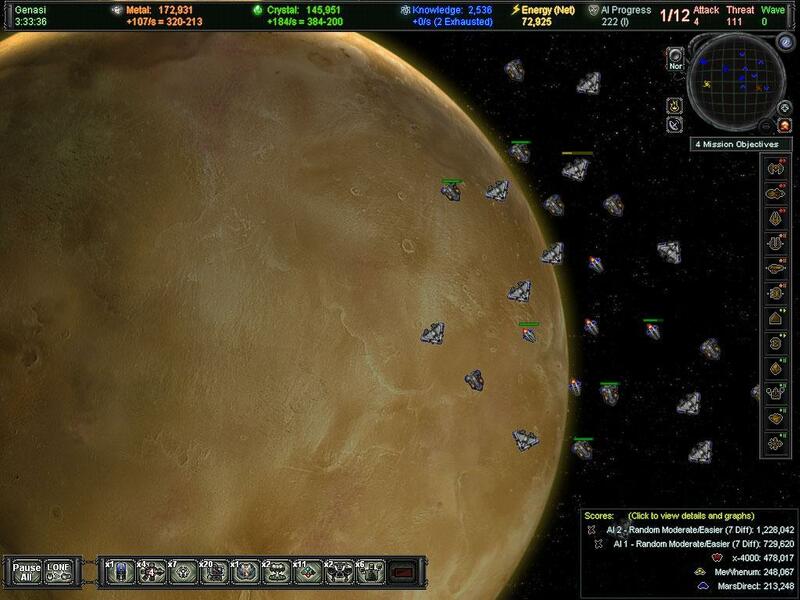 RTS games are much more about prioritization and keeping all the different parts of your military empire in good standing as you proceed; in a complex RTS, there is not enough time to manage every little detail, so you have to trust to the unit AI to a certain extent, and manage only those aspects of the game that are most important at the time. That sort of mentality creates a fundamental difference in feel between AI War and other 4X titles. AI War has been called the first “grand strategic 4X tower defense RTS,” and I think that’s as apt a subgenre title as anything – the more you play the game, the less it feels like any other title out there at the moment.We’ve seen it in action, but how about telling us what AI War is all about from your point of view. How does the final game differ from your original idea? I’ve mentioned already that I’m a believer in iterative development, and that really shows with AI War – the original concept is almost nothing like the actual finished game. 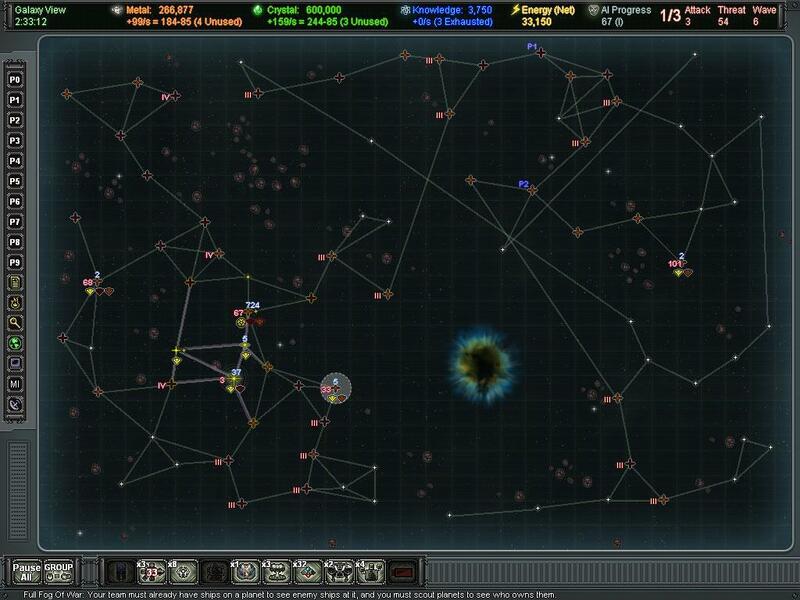 AI War started out as a turn-based affair, emphasizing line of sight and positioning, with symmetrical AI. However, through extensive, extensive playtesting and brainstorming with my alpha testers, the design shifted over a period of months to what you see now – realtime, asymmetrical, no LoS concerns. We’d play the alpha version twice each week, and then talk about what was going right and what was not. Then I’d work on a new build, scrapping the un-fun parts and adding new ideas for the next week’s session. The result was something that I never could have imagined in advance, and that’s the key benefit of iterative design versus more traditional methods. However, all that said, there are certain facets of the game – what I like to call my “immutable design goals” – that never changed despite how much else was changing during our iterative process. I knew I wanted this to involve a lot of difficult strategic decisions, that it should play out over 7-12 hours or so per campaign, that co-op was going to be a central feature, that cunning AI was to be another central feature, that it was to have as large a unit cap as possible, and that it had to have no “easy shortcuts” like rushing or turtling in other realtime games. When looking for what AI War is all about, I think that list of goals actually sums it up pretty nicely! What was the hardest part in developing the game? What did you think was going to be hard but turned out to be simple? The basics of the engine of AI War were something I had already created for another Arcen title (Alden Ridge, which is slated for 2011), so a lot of the rendering and architecture and general engine concerns were already well-established. What was completely new to me with AI War was the multiplayer networking and AI – and both of those were quite challenging, to be sure. They worked out quite well in the end, but those were the two elements that gave me the most heartburn during development, so to speak. Multiplayer desyncs were the bane of my existence during alpha, as is typical for a lot of RTS developers from what I’ve heard. Something that I thought would be really hard, but which turned out to be (relatively) simple, was the high unit cap of the game. I have always been a fan of large RTS games, and having a cap of 500 units per player as is common has always felt limiting to me. In AI War, I had fantasies of maybe having a global population cap of 15,000 units for 4-6 players, but I figured I’d have to do a lot of tricky things such as “draw three units but treat it as one,” or something like that – maybe “stacking” of units as in Civ games, or something like that. In the end, I was able to achieve 40,000 to 60,000 units simulated in realtime without lag on upper-middle-end hardware, and that was a huge surprise to me. I’ve actually recently had a player who is 55 hours into a campaign, with 201,000 units in his map – I was blown away, having never seen more than 90,000 at once. That 200k campaign doesn’t run well on even my quad core workstation, but the player in question has his quad-core overclocked to 3.5 Ghz and says it runs without lag except for a tiny bit when he issues commands to 4,000+ guys at once. I had just assumed that these sort of numbers were absolutely impossible, but for a space game with the right sort of engine and 2D graphics instead of 3D, it’s demonstrably possible – and that’s in the C# programming language, not even C or C++. Making a multiplayer game with no player vs. player conflict is an interesting choice. How does this team-only approach fit into the AI War universe? The decision to not include pvp was one that I made for a few reasons I’ve hinted at above. First off, I don’t play pvp RTS games myself, so I’m not an effective SME for them. In order to really make a great pvp experience I’d need someone with lots of experience in that area, but that person isn’t me; I knew just how to set up and design a co-op experience, though, so I put all my energies into that and the single player modes rather than spreading my attention around too thinly. Secondly, the RTS market is just glutted with competitive strategy titles. If you want to play competitively, the sky is the limit – you can pick most any RTS game that strikes your fancy in a given year, and it will probably do a serviceable job for you at least. To me, not only is that a market in which I don’t have any expertise, it’s also a very crowded market. I’m a huge proponent of co-op in general, and believe that every game should ideally be playable with friends or family (who wants to sit alone every time they want to game – or, worse, who wants to obliterate their lesser-skilled family members every time they try to play them in pvp?). For me, the team-based aspects were my entire purpose in creating the game. What are some of the challenges you faced bringing AI War from concept to reality? As an indie starting with a zero dollar budget, everything except the game design and programming was a challenge. Of course, both programming and game design are also quite challenging, but these were areas in which I had lots of prior experience and which I could resolve with time. But no amount of time will make me a great artist, or a composer of any merit! This sort of scenario is utterly common for indies, and for a lot of the aspiring indie programmers this can even be a permanent roadblock that makes their game never see fruition. For me, I focused on the game itself and the fun-factor first, using free graphics graciously provided by Daniel Cook, the artist you may recognize from the classic game Tyrian. Coupled with his work, I cobbled together some lesser-quality stuff of my own, and that’s the state in which we went live with our 1.0 version. Since I lucked into meeting Pablo, we were able to have great music in the game right from the start. As the early public versions of the game became increasingly popular in a niche sort of way, so too did our options increase. For the first seven months of the game’s post-release life, I’ve actually reinvested all of the money the game has made into Arcen itself – when I go fulltime game developer in December, that will be the first income I actually make from the company. As a tiny little indie developer, these are often the sorts of choices you have to make, and there’s nothing to do but make the best choice you can at each step of the way, and then improve things as your finances improve. Was there any feature or element that you had to cut from the game that you wish could have made it into the final product? I always have a laundry list of features that get cut for reasons of scope; it’s the nature of the business, I think, and a sign of a healthy product if there are a lot of extra ideas surrounding it. There wasn’t any particular one feature that I really wanted to see in the base game that got cut, but our first expansion, The Zenith Remnant, basically has a lot of the content and ideas that didn’t make it into the base game -- plus a whole host of new ideas from players themselves. In looking at the base game, the biggest thing that I wanted to address was increasing variety in the grand strategic aspects of the game, so that has definitely been a prime focus for the expansion. As word is getting out about this title, AI War is building a dedicated fanbase. In what ways are you working with and learning from the game community? We have an absolutely huge Development Discussion section of our forums, and players put suggestions, commentary, balance ideas, exploits, and bug reports in there. Then there is a whole lot more discussion on each item, and then many of those items make it into the game. In October we released our giant new 2.0 version of the game, which is a far cry from the original 1.0 version we launched with. Community feedback was absolutely instrumental for that process. Likewise, probably half or more of the new ships in the first expansion were suggested by players. I always have to evaluate every idea for its feasibility and how well it fits within the overarching design of AI War, but I really enjoy collaborating with the community in this way, and they seem to get a lot of satisfaction out of it, as well. Most important for Arcen, this lets us really give players what they want while still keeping a cohesive product and game universe – rather than having a lot of divergent and non-cross-compatible unit mods that only a few players might see, the ideas that make it through our development discussion process become a part of our core products so that a much larger segment of players will actually see them. By seeking feedback from our player community early and often on our titles, that also gives us the freedom to really innovate and try new things, thanks to the security of getting to try those innovations out on players before official release. Players aren’t shy about voicing their distaste when a new idea isn’t a good one. Having an army of constructive critics is an incredible boon for us as a company. What plans are in store for the future of AI War? For the future of Arcen Games? The first expansion for AI War, The Zenith Remnant, is currently available for preorder through our site, and is undergoing a public alpha/beta development cycle. The expansion will be officially released in January. It’s a pretty notable expansion, with over 100 new ships added to the game, along with new AI types, map styles, a new third-party neutral faction, and a lot of grand-strategy-enhancing new capturables in particular, including the massive new Golem ship class. Next on the slate for Arcen is a casual puzzle game that is currently untitled, but which we’ve referred to as “Feedback” in the past. That’s the brainchild of my friend and colleague Lars Bull, who I mentioned earlier, and it’s quite a fun game and completely different from AI War. After the puzzle game our next title will be “A Valley Without Wind,” which is basically a new take on the quite-overcrowded tower defense genre. There are a few TD games that I love, but largely I have always felt like they sort of missed the mark from what I was really looking for. So AVWW is the game that is resulting from that, similar to how AI War resulted from my frustration with co-op options in other RTS/4X titles. Beyond that we have a long list of other titles planned, but it’s too early to talk much about them yet. Any chance we'll see DLC in the future? Absolutely! And our DLC is always free for customers of our base game. We haven’t had any official DLC released since our 2.0 version of the game, mainly because there are a lot of huge features coming in this next DLC patch. 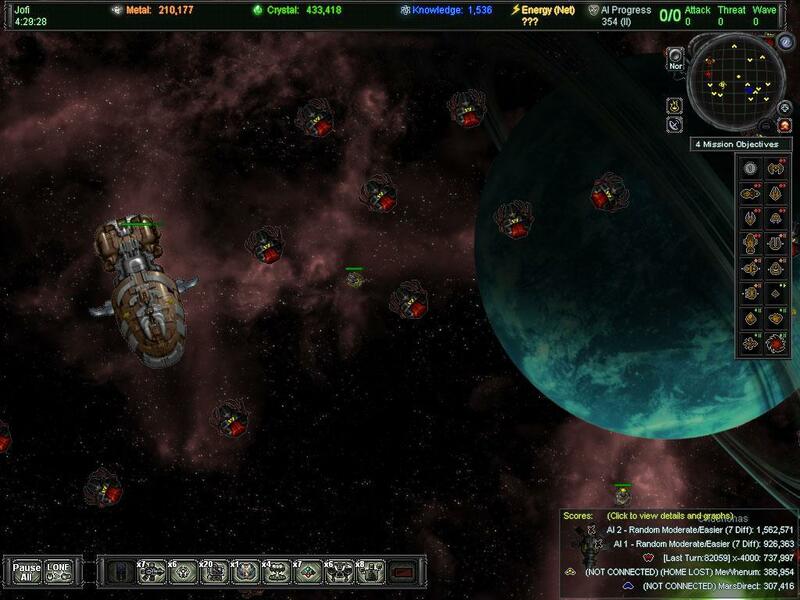 That should be out sometime in December, and will include some helpful new ships (“control nodes” chief among them), a new co-op mechanic (“home command station cores”), various balance tweaks and bugfixes, and even a new unified command queue, which many players are quite excited about. Much of that is already publicly available in our beta prereleases for those who are interested in getting it early. After the release of The Zenith Remnant, when we’ve primarily moved on to other projects, we’ll still be doing free DLC for AI War on roughly a monthly basis. In the January/February timeframe, we plan to add a new form of multiplayer matchmaking, for instance. We’ve looked at other offerings on the market for matchmaking, and while those are very nice, they aren’t really designed around long-form cooperative games, so we’re doing something new. In general, I’m planning on having some level of free monthly DLC for AI War for another 2-5 years at least, depending on player interest. We’ll also be putting out new paid expansions every 8-12 months or so, again depending on player interest. But reception to our first expansion has been so positive that I think that at least 1-2 more expansions are all but guaranteed at this stage. Can you talk about your experience with the various digital distribution outlets? How critical is it to get your game on the services and do you think that they are helping or hurting indie game development? Unequivocally, I can tell you they are helping indie game development. They take a cut of royalties, of course, but compared to retail deals (of which Arcen has several in the works), it’s a pittance. They don’t have any sort of creative control over products they publish, nor do they require any sort of money or anything from indie developers, so I don’t see how they, as a group, could be seen as anything but positive. Now, in the casual space there are some distribution outlets with royalty agreements that seem rather predatory, but thankfully for the mainstream downloadable indie channels that is not an issue – we work with Impulse, Steam, Direct2Drive, and GamersGate, and while each is different to work with and to buy from, they are all clearly passionate about games, as well as excited about indies. It can really be a challenge to catch their eye when you are an unknown, and we ran up against that repeatedly early. Impulse was the first to take a chance on us, and after seeing our great success on that platform, others also added us to their catalogues. We'd like to thank Chris for taking the time to answer our questions.